Last night marked the beginning of the Savannah Film Festival, easily the best single week you can spend in the city of Savannah! 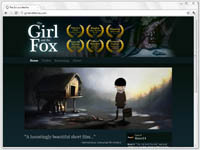 As noted earlier, “The Girl and the Fox” is among one of the featured films, as a part of the Student Competition “B” programming block, and I’m all kinds of excited! This is my fourth year at the festival, and second as a featured director. “Duck Heart Teslacoil” was featured in 2009. Last year I was a blogger for “Voices of the Fest”. Coffee Talk – Short Films and the Festival Circuit. What Works? Also, I’m providing a fun and detailed account of my own festival experiences on my personal Twitter account, so do follow up, if you please! The most important one at this point is the Savannah Film Festival! I will be there for the entire week of festivities, so watch for more to come about the SFF very soon!!! “Rain Dance” is the first film where we’ve been able to overlap production schedules. The film has been in development since Fall of last year, when “The Girl and the Fox” was still in corrections and post-production. We were able to do this by bringing on a second director, the very talented and honorable Nate Swinehart. “Rain Dance” was Nate’s original concept, and Tyler came on as Producer, agreeing to house the film under the umbrella of the Base14 Studio. Much of the elite squad on “Rain Dance” are veterans of the “Girl and the Fox” crew, including Nate, so this was a natural progression. Base14 will assist with production, promotion and distribution. So it’s all win-win. The best part of this announcement is you barely have to wait to see this fine creation! “Rain Dance” will be shown in its first public screening this Saturday, at the ever-popular SCAD animation showcase SCADanimate! This is set to be a test screening, where the producers will be analyzing audience response and making recommendations for further post-production work based on reactions. Feelin’ Good About New Festival Dates! Another festival that Base14 has been featured in before, the FGFF is the most upbeat, friendly film festival there is and we’re proud to be the opening film of 2011! Each year thousands of audience members gather in Iowa City’s historic downtown to watch diverse films at Landlocked, attracting great talent and culture to the heart of the country. A large festival for art, technology and society, Prix Ars Electronica hosts an animation festival that showcases outstanding work from around the world. The premiere independent film event of Naperville, IL, this festival attracts lots of top notch film and talent to what is known as one of the most livable cities in the USA. Indy Film Fest This Weekend! So to all my friends and family back in the Heartland, please don’t miss this great opportunity to see our hard work up on the big screen! Associate Producer Alysha Kupferer will be there on Saturday to represent the film and take any orders for adorable fox rings. 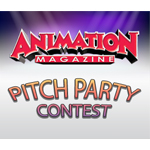 Big thanks goes out to everyone who voted for our TV show concept “Duck & Monster” in the Animation Magazine Pitch Party Contest last month. Because of your brilliant support, we won the 1st Place Staff Pick among all the other entries! Now this isn’t the grand prize that includes us getting to pitch to a industry executive, but it was great to be the favorite pick of the magazine staff, and also exciting to be among the favorites of two judges: Ted Biaselli, Exec Director of Programming at The Hub, and Linda Simensky, VP of Children’s Programming at PBS. Judges, if you like what you see, feel free to drop me a line. I have plenty of material and ideas to back up the “Duck & Monster” idea. And don’t forget that we have essentially already made the pilot.